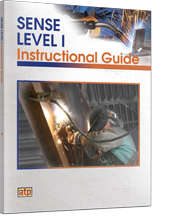 This SENSE Level I Instructional Guide for Welding Programs is designed to help instructors implement a SENSE-compliant curriculum using Welding Skills (5e) and Printreading for Welders (5e). These industry-leading instructional resource packages contain the technical content and skill-building exercises necessary to comply with AWS SENSE Level I Entry Welder specifications and guidelines. Two types of instructional plans are provided for each of the nine SENSE modules. The Instructional Overviews for each SENSE Level I Module provide a script of how to use various ATP resources to offer learners a variety of experiences to learn and apply SENSE content. The Unit Instructional Plans for each module detail relevant ATP resources, instructional points, review tools, and evaluation materials that will help learners become successful entry-level welders.